Macy Lucas is a registered nurse with her main focus in cardiology. She graduated with a Bachelor of Science in Nursing from Grand Valley State University. Flu shots help protect people from getting influenza, a disease that can lead to hospitalization and even death. Because flu vaccinations contain an inactivated version of the flu virus, they cannot cause influenza. Receiving a flu shot may cause side effects that are similar to flu symptoms, however. Furthermore, although flu shots are typically quite effective, it is still possible to get the flu despite being vaccinated. Soreness, redness and swelling around the injection site are the most common side effects of the flu shot. Other possible side effects -- including cough, fever, aches, headache and fatigue -- are similar to flu symptoms, although they are typically less severe. Side effects are usually mild, begin shortly after the injection and last 1 or 2 days. Severe allergic reactions occur in less than 1 in 1 million people receiving a flu shot, according to the Centers for Disease Control and Prevention. Allergic reactions are more common in people with an egg allergy. 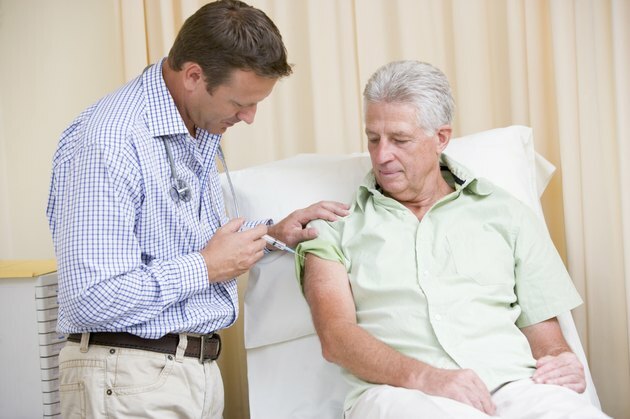 People may develop influenza if they are exposed to the flu virus shortly before or after receiving the vaccine, before the shot has a chance to work. Influenza may also occur if a person is exposed to a flu virus that is not contained in the vaccine. Some people -- depending on their age and overall health -- develop less immunity after receiving a flu shot, increasing the chances that they will become sick with influenza. Flu-like symptoms may be caused by a number of other illnesses that are not affected by the flu shot, such as the common cold.